My family has used Johnson's baby products since I was a little girl. I have used and currently use them on my boys. And I get no complains, other than when we try to use something other than Johnson's products. When you have sensitive skin you want to make sure you use products that won't be harmful to your babies. These products are great not only from when they are babies but as they as they get older. It's bath time. Both of my boys love to take baths. But one thing most babies and kids hate is for you to wash their head/hair. I love using JOHNSON'S® HEAD-TO-TOE® Baby Wash. My boys never stopped playing and it never iritated their eyes. Soap-free, dye-free, hypoallergenic and allergy- and dermatologist-tested. These products are great from start to finish for babies and your little ones. Take care of their skin after the bath with JOHNSON'S® Baby Lotion. I love how the lotion smell. You know when people say they love that baby smell, it's the JOHNSON'S® they are smelling. I use JOHNSON'S® Baby Oil on my body because it leaves it smelling good, nice shiny look, and it's great on my skin. They have so many products to chose from bathtime, bedtime, cleanse, moisturize, hair care, diaper care, sun protection and much, much more. Have you tried Johnson's products? Would you like to win a $50 gift bag full of products? This giveaway ends on Tuesday, July 6 at 8 am. 3 winners will be selected at random.org. Please leave an email in your comment. Winners will have 24 hours to claim their prize. Thank you and good luck. ***Disclosure-I was sent a Johnson's product's gift basket. These are all my honest opinions. Johnson's baby products are used and have always been used in Independentmami's house. I like the Johnson's baby powder. It helps keep me dry in this HOT Texas weather. The Johnson Buddies No More Tangles hair detangler. This works great on my granddaughter's hair. My favorite is JOHNSON'S® Baby Shampoo. It is very gentle and doesn't sting if it gets into my daughters eyes. My favorite product is the Johnson's baby lotion. I too love the way it smells. I am followin you on twitter @mommy2alexa. I 4got my email in previous post. I love johnson's head to toe body wash! I never have to worry about a dozen different items, as it is an all in one, and it is gentle! My favorite is the head to toe baby wash. It is all in one and doesn't take up a lot of room to store it. Their baby shampoo has been my fav for years. I love Johnson's baby shampoo!! I love smelling my sons hair after I wash it!! I love the JOHNSON'S® Baby Lotion because it is so soft on my baby and smells so good..I even use it for myself. I tweeted about this give away. I'd like the Johnson's Baby Oil. It will help keep my skin moisturized. I love the JOHNSON'S® BUDDIES® NO MORE TANGLES® Detangler, my daughter need it every morning! Love the mell too! Love the shampoo and lotion. Smells great! I love the johnsons buddies soap...the kids love being able to do it themselves! I like Johnson's bedtime bath and lotion. It really is soothing and smells SO good! I love the baby shampoo!! I love the Johnson's Baby Bath Washes especially the lavender scented ones. 3Boys_OldLady follows IndependentMami on Twitter. i love the head to toe wash because i product for body and hair is great only one bottle to keep track of. I love the head to toe baby wash! We use it like crazy here! I like the JOHNSON'S® BUDDIES® NO MORE TANGLES® Easy-Comb 2-in-1 Shampoo because it works! I like the Johnson buddies hand soap, my boys feel so independant using it. I twitted about your giveaway. I like the baby shampoo because it doesn't bother my kids' eyes. We always use the baby shampoo, as it's no tear solution is great for kids. Our boys are forever getting it in their eyes and it doesn't hurt! I love Johnson's baby lotion - it makes everything soft and it just smells so good!! I love Johnsons baby powder. It is perfect for everyone in our home. We all use it to stay cool and comfortable without chafing. Hi, my favorite is the JOHNSON'S® BUDDIES® NO MORE TANGLES® Easy-Comb 2-in-1 because it saves me from needing to use conditioner. I love Johnson's Baby Lotion...has that great baby smell! I love the baby lotion! Nothing smells better!! The detangler is definetely my fave. Especially with 4 girls and a bunch of hair! I would like to try the detangler b/c we have 2 girls with long hair. 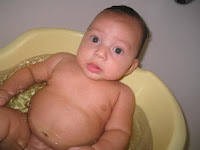 We've been using Johnson and Johnson lavender baby wash for years! I love it!! My girls always smell so nice! :) Thanks! I like the Johnson's head to toe body wash because it smells so good, and don't hurt the baby's eyes! My favorite product is Johnson's baby lotion, because of the sweet smell. Love smell of the baby lotion! I like Johnson's baby shampoo. I remember my mom using it on my hair when I was growing up. I love the John's No-More Tangles! I was just planning on picking some up from the store because it is the only shampoo that works for my thick hair. I like the night-time wash, with the lavender! My favorite product is Johnson's baby lotion. I LOVE the smell. It is what makes a baby smell like a baby! A wonderful smell! my favorite is head to toe body wash because it is so gentle and tear free! I love their hair detangler. Sometimes I even use it. We have very fine and extremely thick hair that tangles all the time. We use it all the time. I like the J&J buddies soap. My girls love the green baggie it is in and I love that it does not slip all over the place! My favorite is the JOHNSON'S® Baby Shampoo because it's gentle and smells really good. A new winner has been picked today due to the original winner not claiming their prize.